Trevor Pateman's Philately Blog: Is the SPhA a Reliable Partner? After the creation of the Soviet Union, all stamp issues previously in use were quite rapidly withdrawn from sale. Imperial stamps at last disappeared, except when overprinted as Philatelic Exchange stamps, and so too did the issues of the Far Eastern Republic, Ukraine, and the Transcaucasian republics. At the same time, the Soviet Philatelic Association (SPhA) was attempting - with some success - to establish itself as a commercially important entity, able to generate foreign exchange from stamp sales, but also able to control private philatelic speculation through the use of philatelic exchange controls. In both contexts, the SPhA sought to centralise all the remainder stamp stocks and associated material which were scattered across the Soviet Union. I think there were just three centres: Moscow, Kharkiv and Baku – though over time I think everything gravitated to Moscow. According to C Zakiyan and S.Saltikov in their 1988 book Post and Postage Stamps of Armenia, a Soviet delegation arrived in Yerevan in September 1924 and took away some of the handstamps used in the period 1919 – 23 and still lying around in the post office. I have no doubt that they also organised the transfer to Baku and/or Moscow of very large quantities of remaindered stamps and that they did the same when they visited Tbilisi. The SPhA outpost in Baku was manned by S.Kusovkin who owed his appointment directly to Chuchin (I once owned the appointment letter ex the Voikhansky collection). 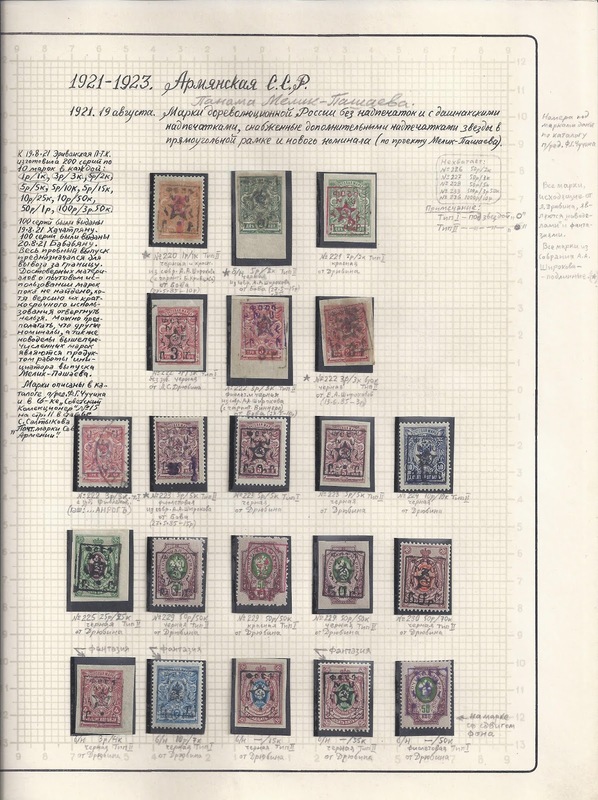 Kusovkin is known to have organised the AzVoka reprints of Azerbaijan overprinted stamps, taking the opportunity to create new varieties from the old handstamps and it’s therefore possible that he did the same if he was entrusted with any Armenian handstamps. There has, for example, long been a suspicion that the SPhA created varieties of overprint colour on the 1923 Yerevan pictorial issue. It does seem that though some values of this set acquired red overprints from the rubber handstamps in Yerevan which then went into normal postal use not all values were overprinted in red. It does seem that if for no other reason than to please those who like things in Sets, the SPhA did fill in the missing combinations of value + red, but in very small quantities so that they are rare. 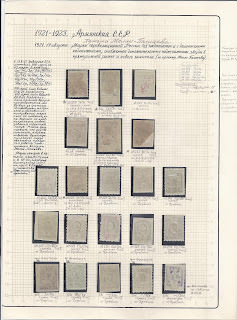 The alternative explanation is that those overprints were created in Yerevan as trials or proofs and not put into use so that they were all available for transfer to Baku or Moscow in nice MNH ** condition. Either way, there is a small group of value + red rubber handstamp combinations which did not see postal use. I would like adding to your blog as to the SPhA machinations something more concerning the rubber surcharges on the Armenia last definitives. I visited Moscow as early as 1951 when one still could purchase some Transcaucasian overprinted stamps through the State shops. I bought there some rubber surcharged stamps of the Yerevan issue - all in some black-violet or violet black colour, although the catalogs list only pure violet or red surcharges. I have never seen used copies of stamps with rubber handstamp surcharges in these black-violet shades. Several decades later, I learned from a very knowledgeable old collector that those were actually reprints made by the SPhA. Thus, one more confirmation! Centralisation put the SPhA in a strong commercial position but, as far as both domestic and especially, foreign sales were concerned, catalogues of what was in stock were also needed. 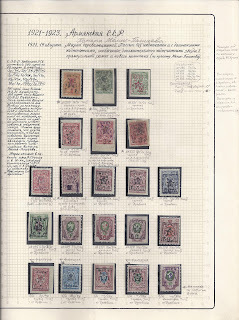 These were duly provided under the editorship of the energetic F.Chuchin and those catalogues continue to have an influence since the 1920s holdings of the SPhA provided the largest assembly of many Russian stamp issues, especially those of the Civil War period. But were the catalogues reliable? The SPhA certainly had qualified philatelists on its staff who knew how to go about things and, for example, the clearly understood a great deal about the 1920 Postmaster Provisionals which they catalogued. 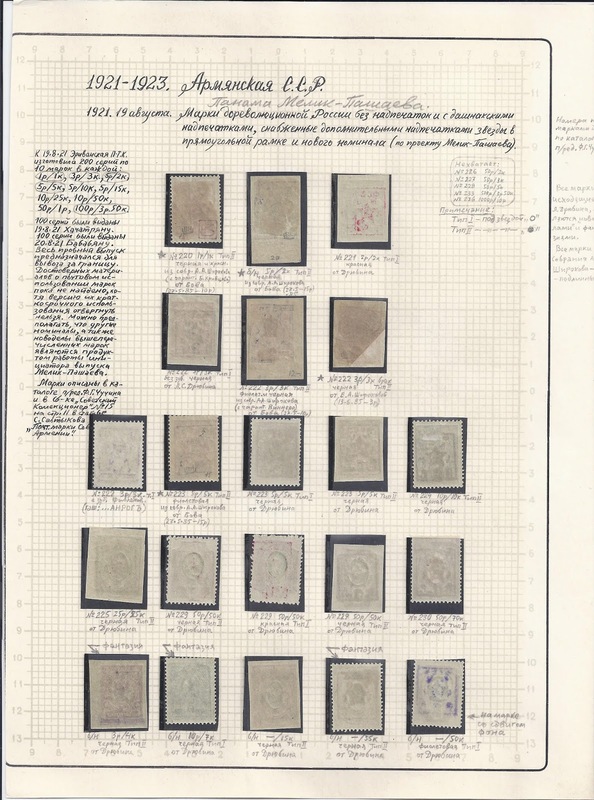 But I think there were also temptations which were created by the fact that the SPhA had also acquired at least some handstamps which had been used to create overprinted issues and this I have already suggested in relation to the work of Kusovkin in Baku. This is one reason why it is extremely difficult to make sense of what happened in the Armenian post office in 1921. For most of that year, letters were paid for in cash (not that there were many) – a claim for which Zakiyan and Saltikov found archival evidence. At the same time, various trials were going on in the back room aiming to turn the very large stamp stock (about two million stamps) inherited by the new Bolshevik regime into properly Sovietised issues. These trials were messy, improvised and inconclusive. At the end of the day, there was an awful lot of material put in a cupboard and just 200 sets of 10 stamps handed over to S Khatchaturian and G.Babaian to see what they could sell them for in Constantinople, where the young painter Khatchaturian (1886 – 1947) would also have chance to discuss with the printer his stamp designs for the forthcoming First and Second Yessayan issues - stamps which would provide a decisive break with the past of messy overprinting. We only have a sketchy idea of what those 200 sets of 10 looked like because we somehow have to locate them behind a much longer listing in the 1926 Chuchin catalogue and an even longer one in 1960 Tchilingirian and Ashford. Basically, the set of 10 has got submerged into all that went into the cupboard in Yerevan and – possibly - all that Kusovkin or the Moscow SPhA added to the stock by way of new combinations of overprint. Zakiyan and Saltikov try to separate out the set of 10 but provide no illustrations to help the matter. In this context, it is interesting to see how a distinguished Soviet philatelist, Ustinovky (author of a big handbook on Tannu Tuva), went about the matter in the 1980s. See the page from his collection shown below. He is still trying to do it with Chuchin numbers and the simple truth of the matter is that for most of his stamps, the forgers have got their first – they have made the stamps which are otherwise impossible or almost impossible to find. In this case, I don’t think we are looking at things from the Yerevan cupboard or even at old SPhA material made from genuine handstamps. I think we are looking at modern forgeries using fresh MNH** clean Imperial stamps and newly-made handstamps. But when you turn over the stamps, as I have done in the second illustration, you see that some of them have old signatures notably VINNER (who is known to have been familiar and reliable with Postmaster Provisional handstamps ) and a BH which I have yet to identify [See now note at end of this piece]. These stamps are also not so pristine – they have been in other collections as you would expect. Ustinovsky seems to have made this little collection in the 1980s and mentions Zakiyan and Saltikov's book in his notes. But he is relying on Chuchin. It is on the copies with old handstamps that I will focus my attention as I continue to try to work out what did happen in the back room of Yerevan post office in 1921.